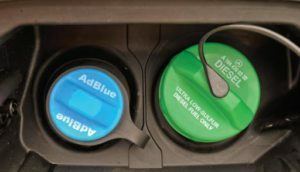 Mercedes Benz diesel maintenance has introduced a new technological feature, a liquid known as “diesel exhaust fluid” (DEF) and goes by the trademarked name AdBlue. DEF, or AdBlue, is an aqueous urea solution blended of 32.5 percent high-purity urea and 67.5 percent deionized water. In Mercedes-Benz diesel automobiles, have a small tank holding approximately 7.5 gallons of AdBlue under the trunk in the rear of the vehicle. A full tank of AdBlue should last about 10,000 miles. At German Car Depot, South Florida’s premier independent service center for Mercedes Benz diesel maintenance. We want your vehicle maintenance experience to be low cost and stress free. Your Mercedes-Benz comes equipped with the Mercedes-Benz Maintenance System. The Maintenance system tracks distances driven and the time elapsed since your last service. Your maintenance service icons show up in the multifunction display in the instrument cluster. One month before a maintenance service is due; a message will appear in you display. The message sent to you will show the remaining miles or days until your next Mercedes Benz diesel maintenance is due. German Car Depot will perform the required diesel maintenance and reset the Maintenance System service indicator by confirming the service items were performed. Depending on the Mercedes Benz model you own, you may see messages on your instrument panel for Service A all the way through Service H.
In Florida we have very hot, humid and rainy conditions that require more frequent maintenance. GCD has provided some recommendations to keep your Mercedes-Benz running strong for decades in the Sunshine State. Tire Balance and Rotation Every 5,000 miles: Some tire sizes cannot be rotated. Regular inspections, pressure checks and balancing will help maximize the life of your tires. Brake Fluid Replacement Every 2 years or 20,000 miles: Brake fluid constantly absorbs moisture from the air; this lowers the boiling point that would impair braking efficiency if not replaced regularly. Climate Control Dust Filter: Every 1 to 2 years or 10,000 to 20,000 miles:the integrated filter can filter out most particles of dust and pollen. A clogged filter reduces the amount of air to the interior of the vehicle. Engine Air Filter: Every 1 to 2 years or 10,000 to 20,000 miles: a clogged engine air filter can rob your engine of power, reduce fuel mileage and cause damage to certain engine components. Transmission Service: Every 3 to 4 Years or 30,000 to 40,000 miles: every time your transmission shifts it causes heat and friction that breaks down the fluid causing it to lose its lubricating qualities. This can cause premature wear and internal damage. Engine Coolant: Flush Every 3 to 5 Years or 30,000 to 50,000 miles: over time corrosion and mineral deposits can build up in your engine’s cooling system reducing its ability to keep your engine cool. Once deposits build up it can be very costly to repair.